The College held its fifth annual Futures Conference last week. The conference is an important element in our strategic planning process, as it brings together students, Governing Board members, community members and PCC employees to discuss matters of College-wide importance, and to engage in small-group discussions that surface new ideas. Futures Conferences are a vehicle for constructive community engagement — we partner with the public, seeking advice and innovation. Guided Pathways, clearly defined roadmaps to credentials that let students get the best return on their investment of time and resources. Centers of Excellence, which enhance student success and economic development by providing students with rigorous, best-in-class training so they can succeed in leading-edge sectors of the economy. I opened with remarks that put the College’s work into prospective. New technological, economic and demographic realities are converging to create an age of accelerated change not seen since the 1440s, when Johannes Gutenberg introduced mechanical printing and ushered in the modern age. These changes, which range from the rise of Artificial Intelligence to persistent education and skills gaps, present higher education with numerous challenges. The foremost is realizing opportunities within our grasp today while preparing for opportunities of the future. This is a formidable task, given that 65 percent of today’s first-graders will be employed in jobs that currently do not exist. My path forward for the College, unsurprisingly, is to improve delivery of instruction and services so our students have the knowledge, skills and abilities to thrive regardless of what the future may bring. Clearly, given this uncertain landscape, the College needs the insights of its partners, and Future Conferences are an excellent way to leverage their creative energy. Past conferences have resulted in real change. In 2017, attendees identified as priorities “Establish guided pathways for in-demand programs” and “Align College programs, processes, systems and resources to support economic opportunities within Pima County through relationships with local business and industry.” Those insights were woven into the 2017-2021 Strategic Plan, which was approved by the Governing Board in May 2017. I am confident this year’s Futures Conference will yield similar advances. This entry was posted in Uncategorized and tagged Centers of Excellence, community engagement, diversity, economic development, Futures Conference, Guided Pathways, inclusion, strategic planning, student success on March 13, 2018 by pimachancellor. The answer is critically important to the College. We need to demonstrate to the peer institutions who accredit us, and to the public, that we can accurately ascertain our strengths and areas needing improvement. Over the two-plus hours of the conference, attendees met in small groups. They proposed a wide range of indicators to effectively measure performance in several areas, including diversity, student access and success, and community engagement. The information gathered at the conference will be refined and converted into Key Performance Indicators that, pending Governing Board approval, will be embedded into the College’s strategic planning process. This was the third Futures Conference held by the College. All have been expertly organized by our Office of Institutional Research, Planning and Effectiveness. Dr. Nicola Richmond and her team — including Michelle Henry, David Purkiss, table facilitators and other volunteers – once again did a great job in bringing together a diverse group of internal and external constituents to creatively collaborate on an important topic. This entry was posted in Uncategorized and tagged Accountability, Futures Conference, Key Performance Indicators, KPIs, mission, strategic planning on April 12, 2016 by pimachancellor. PCC is committed to serving the needs of the community. A critical piece of this commitment must be serving the needs of the individual. However our mission is defined, it must drive PCC to success in ways that benefit our diverse students. One might need Adult Education, another Developmental Education. A student seeking the skills for gainful employment is best served if we successfully align Career and Technical Education curriculum with the needs of business and industry and offer short-term, stackable credentials. A student looking to obtain a bachelor’s degree makes it incumbent on us to improve connections with K-12, colleges and universities to ensure seamless transfer. A student balancing work and family obligations needs PCC to provide robust online programs. I began and ended the conference with personal stories of students who succeeded at PCC after taking long and winding education journeys that sometimes tested their resolve. One of our former students graduated from a local high school, served in the military and graduated from college, yet could find work only as a server in a restaurant. “I did everything right,” she told U.S. Secretary of Labor Thomas Perez when he visited the Aviation Technology Center in January 2015, yet still had not reached her career goal. Then she found, on the ground, a piece of paper with information about Pima Community College. She got her start at PCC through that scrap of good fortune, completed our rigorous Aviation Technology program, and now works at Bombardier. Every path to PCC is a bit different, but student success at PCC should be a function of effective systems, not serendipity. Our mission and vision statements, which will compel change at the College, should be the result of a transparent, inclusive, evidence-driven process. Working together, PCC can help individuals achieve their goals so that collectively they form the foundation of a stable, prosperous community. This entry was posted in Uncategorized and tagged Adult Education, alignment, developmental education, Futures Conference, mission, strategic planning, student success, training, workforce development on April 16, 2015 by pimachancellor. What will it take to be the best? Answer: An unshakeable focus on student success, community engagement and diversity – in short, a commitment to being a student-centered learning organization. Systems thinking: an understanding of how parts fit into a whole and an appreciation that every employee is integral to the success of PCC students. When the electricity went out at West Campus during the monsoons last summer, our Facilities crews worked to restore power quickly, allowing instructors and students to get on with teaching and learning with minimal interruption. In their own way that day, Facilities contributed substantially to the success of PCC students. Personal mastery: an acknowledgement that employees are ultimately responsible for their own success. Employees should look for opportunities to improve knowledge that will help them be more effective at their jobs. Shared vision: Having a common set of ideals – an institutional “north star” employees can look toward in determining how well we are fulfilling our mission. 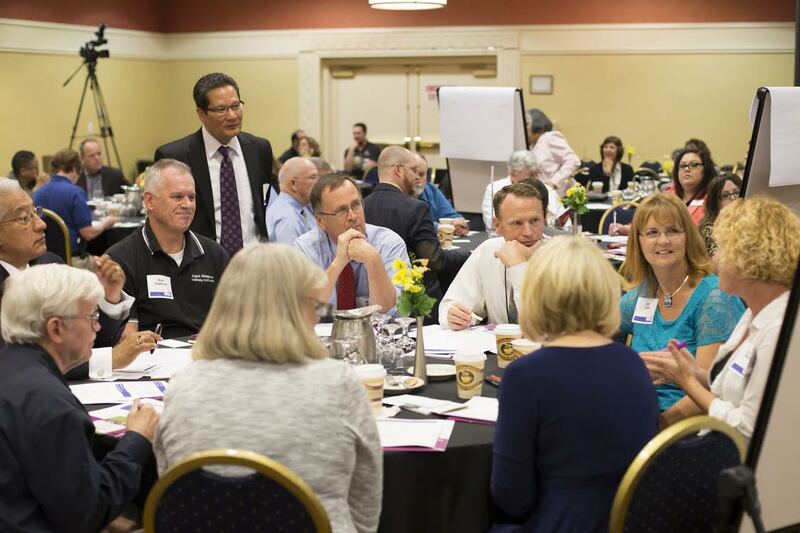 The PCC Futures Conference and strategic planning process, which brought together more than 200 employees and community members to map out strategic directions for the College over the next three to five years, is an example of the College striving toward a shared vision. That college-wide process informed strategic planning at campuses and work units, where employees had the opportunity to offer their insights. Team learning: A work unit is only as good as its weakest link, and it’s the responsibility of the work unit to foster, in a civil and positive manner, a culture in which everyone pulls his or her weight. Mental models: Having a mindset or culture that focuses on the positive is important. I’ve heard it said that at PCC students have a “right to fail.” A positive framing of that issue is that students should have a right to succeed. College must do all it can to help students achieve success. To make these elements a reality, we need an organizational structure consistent with our values and purpose. That has been the driving force behind recent and upcoming structural reorganizations. Executive Vice Chancellor for Institutional Effectiveness Dr. Zelema Harris astutely recognized the importance the College must place on advancement. That emphasis is reflected in the recent reorganization of the College’s “forward-facing” areas, including Marketing, Enrollment Management, Public Information, the PCC Foundation and Web Services, under a new position, Vice Chancellor of Institutional Advancement. Engaging the community — at the local, state, national and global level — is critical if we are to be the best. Similarly, we are working toward hiring a Vice Chancellor in charge of workforce initiatives in order to give leaders in business and industry a single point of contact when they wish to engage with the College. Everyone at PCC is a leader. All employees have an opportunity to influence others, be they students or their fellow employees, through teaching, challenging, communicating and helping. I am confident that PCC can set the standard for community colleges across the nation. This won’t happen overnight. Our current situation took years to develop, and digging our way out will take time. But in three to five years, I am convinced we will succeed, if we work together and focus on our students and the community. That’s what it takes to be the best. This entry was posted in Uncategorized and tagged community engagement, diversity, Futures Conference, Peter Senge, strategic planning, student success on June 21, 2014 by pimachancellor. The College took a major step forward recently when our Strategic Planning Committee recently concluded two days of intensive meetings at out East Campus. The committee did a great job of hammering out a solid framework of student-centered initiatives for the College to undertake over the next several years. In opening the group’s meeting, I noted that a key element for success is recognizing the College’s “mental mindsets,” the term that organizational thought leader Peter Senge’s used to describe an organization’s deeply embedded beliefs. We need to identify those mindsets that might be impeding real change at PCC. I also emphasized understanding the local, regional, national and global context of education, both today and in the future; and most importantly, the need to create a system for learning that puts students first. PCC has many excellent programs and services for students. We need to identify the elements in those programs that make them successful, and, moving forward, infuse them into our institutional DNA. Of course, our initiatives have to be flexible and adaptable; history is replete with examples of plans that went awry because they did not account for rapid change. This is especially true in education. That means constantly listening, especially to students, and taking diverse viewpoints seriously. Benjamin Franklin said, “If you fail to plan, you are planning to fail.” Our strategic planning process is built around helping students succeed. Helping our students achieve their dreams is why we do the work we do. It is why this institution exists. As chancellor, I am determined to returning Pima to being the kind of student-centered College it once was. This entry was posted in Uncategorized and tagged Futures Conference, mental mindset, Peter Senge, Pima Community College, strategic planning, student-centered learning organization on April 4, 2014 by pimachancellor.